To reduce wrinkles and promote elasticity. 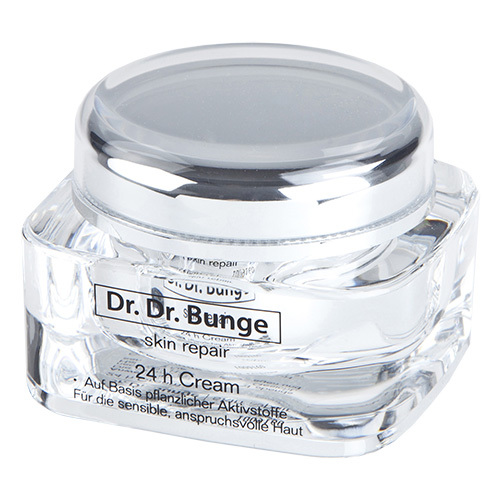 Dr. Dr. Bunge 24 hr. Cream is based on active botanical ingredients. For delicate sensitive skin. „Each skin loses its natural moisture content over the years. In addition, environmental factors such as excessive sun exposure can worsen wrinkles“. That’s why I wanted to do something. My 24 hr. cream contains not only vitamins and moisturizers but also effective agents to reduce wrinkles and promote elasticity. Vitamins, shea butter, jojoba oil, panthenol and concentrated moisturizers nourish and protect the skin. By building and toning your skin with regular use of my products wrinkle depth is reduced over time.